The latest changes to the game can be found here. Stay tuned! Hi folks! Here is additional information regarding our players who would like to try Project Lucie with an Oculus headset and its touch controllers. Project Lucie is not yet part of the Oculus store. 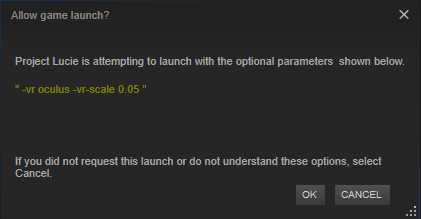 In order to be playable, it is necessary to switch on a specific option in the Oculus settings. Click the gear icon and select 'Settings'. Then, click 'General' and enable 'Unknown Sources', which allows applications that have not yet been reviewed to be played. See the official Oculus website for more information. Project Lucie is currently Pre-Alpha, and contains only a small sub-section of the full game. Project Lucie is playable with full physics support in VR. Playing with Mouse and Keyboard does not support full physics simulation at present (but is a planned feature). This is not final software; content and technology is subject to change and may still contain errors / lack certain features.